We will be exploring the foundations of Downward Dog, Handstand, Forearm-stand and Headstand. 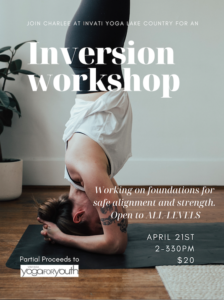 If you have been craving more time to practice your inversion skills now is the time. Join Charlee for an afternoon of fun and exploration. All Levels welcome. Partial proceeds goes toward Vinyasa Yoga for Youth, which is a non profit organization bringing yoga to youth that wouldn’t otherwise have access to it.